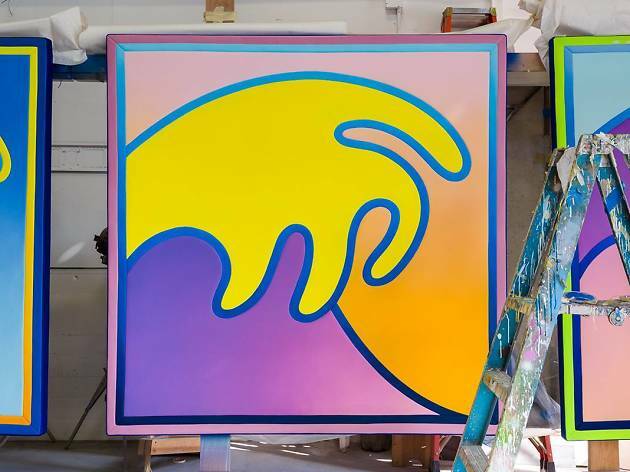 Los Angeles-based artist Alex Israel in here in town to present his first ever solo exhibition in Hong Kong. Israel is showcasing a mix of canvas and multimedia works, including his first feature-length film SPF-18, as a love letter and exploration to his city. The film on exhibit is a teenage rom-com on the themes of love and loss set against the backdrop of LA’s coastal setting, which is accompanied by a life-like interactive sculpture of a brown pelican suspended from the gallery ceiling. Also on show at the gallery are canvas works that incorporate the colours and textures of surfing equipment to form a wave logo, which echoes Hokusai’s famous woodblock print Under the Wave off Kanagawa.